Senators debated a bill on general file March 6 that would improve inmates’ access to communication. 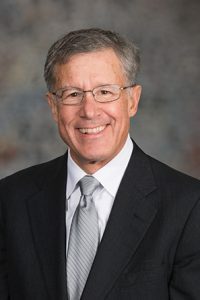 LB776, introduced by Omaha Sen. John McCollister, would require county and city jails to provide inmates with affordable communication by telephone or videoconferencing with their families and legal counsel. Under the bill, each jail could establish a prepaid or collect telephone system, or a combination of both. Inmates’ family members could deposit money into a prepaid account with a third-party provider of telephone services to cover the cost of the call. Any company contracted by a jail to provide such services would be prohibited from charging excessive service rates or commissions. The bill would ensure that phone calls or videoconference sessions between an inmate and an attorney are free of charge. Monitoring or recording of such communications would be prohibited. A Judiciary Committee amendment, adopted 33-7, clarified that an inmate’s access to any attorney would be protected. A person housed in a city or county jail has not necessarily been found guilty of a crime yet, said McCollister. In fact, he said, a study by the ACLU found that over half of inmates held in jail are awaiting trial and are in jail simply because they cannot afford to post bail. McCollister said no one can prepare properly for an upcoming trial if they cannot talk with their attorney on a regular basis. The cost of a 15-minute call can vary from $2 to $20, he said, depending on where the inmate is housed, which can be prohibitive, McCollister said. Further, he said, research has shown that regular contact between inmates and their families and attorneys leads to lower rates of recidivism upon their release. “This would ensure that city and county budgets are not based on the assumption that they’ll be making a profit from detainees and their families,” McCollister said. Sen. Ernie Chambers of Omaha spoke in support of the bill. He said regular phone access is vital to preserving an inmate’s dignity. Jails should focus on building people back up, not building more jails or making profits, said Bancroft Sen. Lydia Brasch in support of the bill. 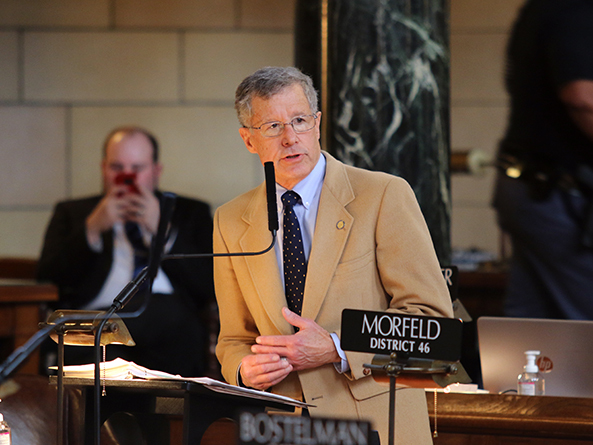 McCollister introduced an amendment that would allow city and county jails that generate revenue from inmate phone calls to retain such revenue to fund inmate programs, so long as it is not excessive. The amendment also would allow the Jail Standards Board to consider the acceptable rates set by the Federal Communications Commission in setting comparable rates for city and county jails. Sen. Mike Groene of North Platte filed a motion to bracket the bill until April 18, 2018. He said the bill would impose a one-size-fits-all solution on something that is not a problem statewide. Gordon Sen. Tom Brewer agreed, saying it might make sense in large counties like Douglas and Lancaster, but that it would amount to an unfair cost shift for smaller counties. The bracket motion failed on a 5-28 vote and the Legislature moved to the next item on the agenda without taking action on the bill.